Mixed-use development — a project that combines both residential and commercial components — has become an increasingly popular model within the American real estate sector. A sharp swing from the suburb & strip mall trends of the 20th century, mixed-use planning instead blends all aspects of life: housing, employment, and recreation; into a single, pedestrian-friendly area. Given Frederick’s long tradition of a strong community-feel and its already vibrant downtown core, it is hardly surprising this trend has been enthusiastically embraced locally. Located on the vibrant Northern Corridor of Frederick, the newly constructed Worman Mill’s neighborhood features over 170 apartments and an 80-bed assisted living facility — arranged around a retail-focused center with ~27,000 SF of commercial space. These retail spaces, ranging from 900 - 4,950 SF have already begun to be tenanted. New tenants include: Elements of Style Hair Studio & Day Spa, Edward Jones, Worman’s Mill Nails & Spas, a bakery, and cafe. 12,020 SF of ground floor retail — including a restaurant pad site - is immediately available. Construction has begun at 1705 North Market Street. This adaptive reuse project will transform the historic Coca-Cola bottling plant into a 121,200 SF mixed-use complex consisting of 9,200 SF of retail and 86 apartments. In a recent FNP article, Devon Lauer, vice president of development for Brick Lane, said that construction is slated to be completed in November or December of this year. Lauer stated the commercial tenants are undetermined at this point, but that the developers are hoping for a restaurant/retail tenant. The residential units will range from one to three bedroom rentals with communal amenities such as a pool, fire pits, an outdoor area, clubhouse and other elements typical of a modern apartment building. The project sits at the north-end of Downtown Frederick, adjacent to Thomas Johnson High School and Rose Hill Manor. Initial plans for another adaptive reuse project with mixed-use intentions were approved by the Historic Preservation Commission earlier this month. The project will take place at the Downtown site formerly home to the Visitation Academy. Next the project must seek site plan approval from the Planning Commission. Project owner Jim O’Hare is hopeful approval and construction will be completed in roughly two years. Renn Quarter, a planned development on Frederick’s east side, will be home to 1000+ new residencies, including apartments, townhouses, and single-family units. The new community will also feature 31,920 square feet of retail space. 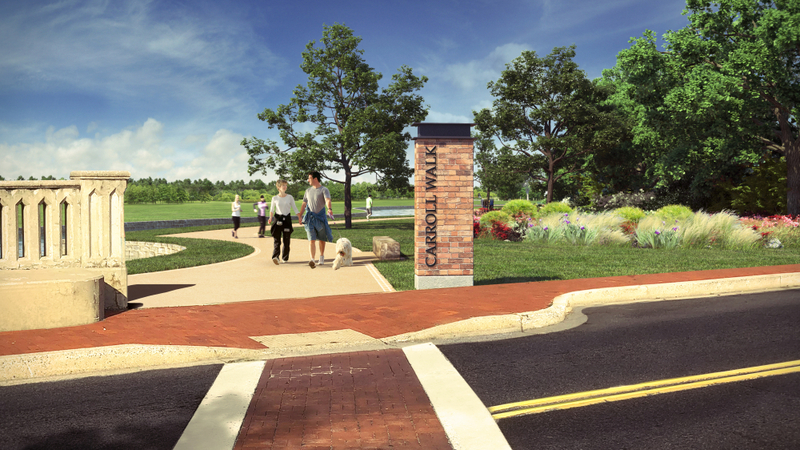 Accentuating the prioritization of walk-ability, this new project will excitingly be connected by pedestrian trails to Downtown Frederick. The developing company, Matan Companies, has committed to the extension of the public Carroll Creek Shared Use Path that currently ends at Patrick Street. When completed, the path will continue past the back of the Fairgrounds, along the Creek, and into a new 70-acre park that is also to be created at Renn Quarter to service Frederick’s East-side communities. To learn more about future commercial opportunities in the City of Frederick, contact the Department of Economic Development online or at 301-600-6360.